Need a good jerky recipe? 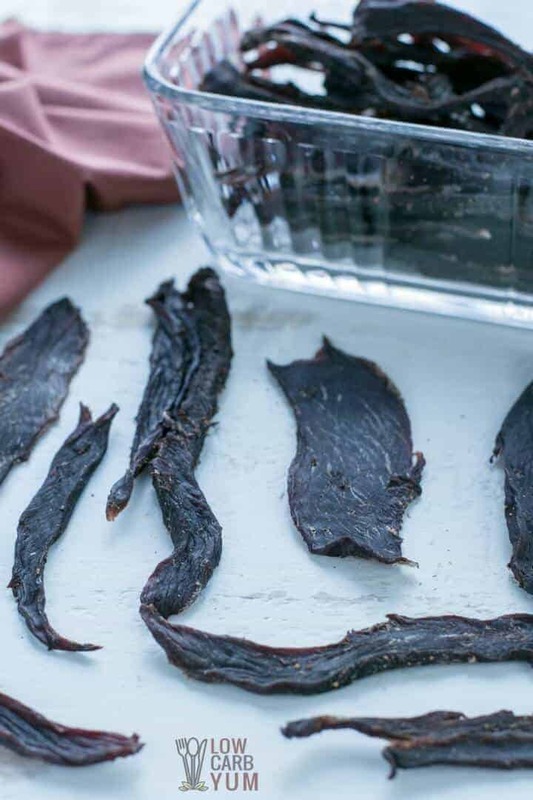 Here’s how to make deer jerky at home in the oven or dehydrator. But, you can use beef or other meat instead. As I’ve been going through the freezers, I realized that either I have to donate the deer meat or make something that will get eaten quickly. My husband and my son love jerky and I probably don’t make it often enough. 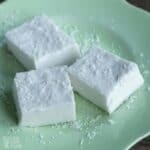 I found some time to make a quick batch this past weekend and it was devoured within a day. Although I always make my deer jerky using a big dehydrator, making venison jerky in the oven uses the same process. For this recent batch, I cut the pieces thin and small so it would be done a lot faster. If you cut it into regular long thin strips, it will take longer. Usually, it takes 10 to 12 hours for my jerky to finish, but this time most pieces were done within 6 hours. Ready to learn how to make deer jerky at home and make your own venison jerky marinade? 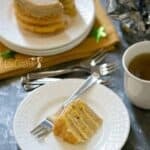 It’s super simple and you can make sure there’s no sugar or preservatives in it. I like to marinate the meat in a gallon size zipper bag. But, if you’re worried about the plastic chemicals leaching into the meat, you can use an all glass container instead. 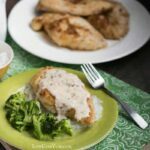 If the meat isn’t already cut, you’ll have to give yourself plenty of prep time. It takes a while to cut up all the meat into thin strips. And, it’s easier to cut if the meat is frozen or partially frozen. 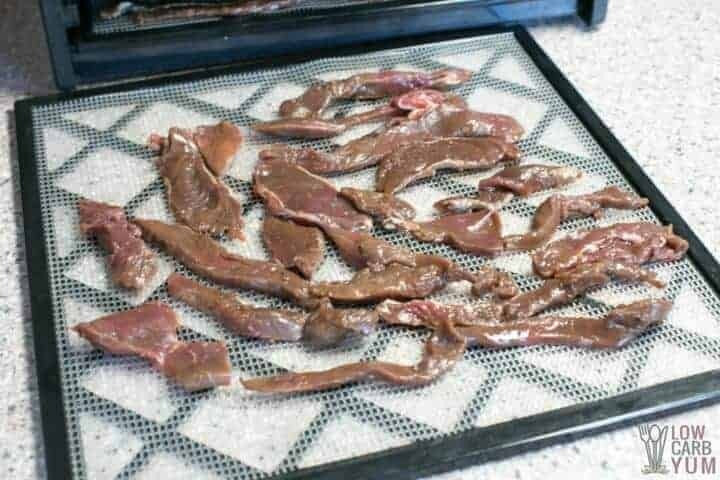 When I first learned how to make deer jerky, I spent a lot of time trying to cut the membranes out. It was a waste of time! After the meat is dried, you wont really notice it. And, if you do, simply cut it out then. 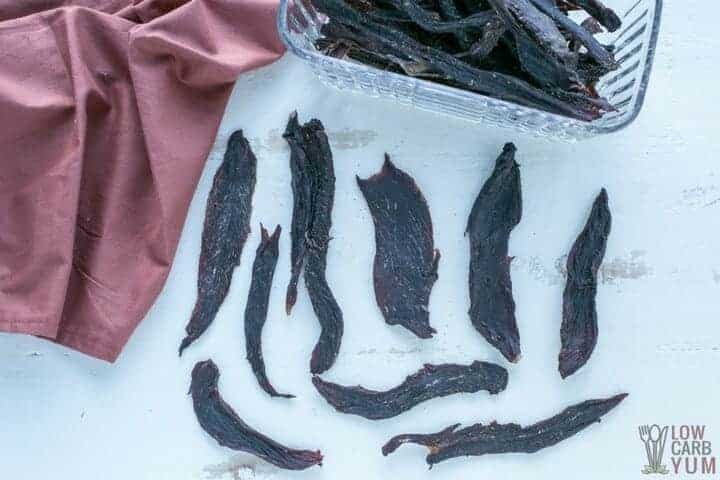 A lot of people who don’t care for eating deer meat really enjoy this venison jerky recipe. In fact, if I don’t tell them it’s deer, most would think it’s beef jerky. It also doesn’t matter if the pieces are various sizes. However, I do try to keep a consistent thickness. And, I like to pull the smaller pieces out of the dehydrator sooner as they cook faster. When learning how to make deer jerky, you need to know when the venison jerky is done. What I do is bend a few pieces. If they break easily, it’s time to take the jerky out. Be sure to check the thicker pieces for doneness before taking them out. They can take a little longer to cook. So if they just bend without breaking, chances are it needs to be dried out more. To be honest, I don’t think you can really overcook the jerky too badly. It’s cooked at such a low temperature another hour or two doesn’t really make a big difference. I prefer the meat to be dried out a bit more and I think it’s better preserved when it is. 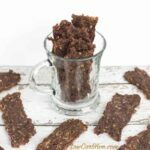 You will find that this deer jerky recipe results in pieces a bit harder than store bought. Adding in molasses typically makes the dried meat softer, but I avoid adding sugar. Most store bought Worcestershire sauce contains sugar so you may want to make your own. 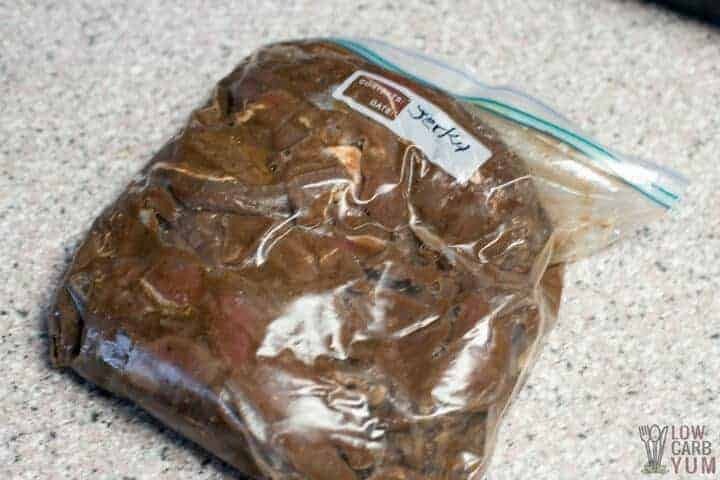 I’m so glad I learned how to make deer jerky at home. The butcher charges a lot to make it and it’s super easy to do yourself. 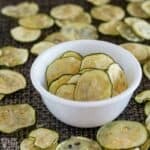 I have a large dehydrator so I can make up huge batches during hunting season. 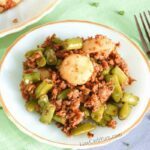 The smaller pieces tend to be a little easier to eat plus they cook faster. But, the bite sized morsels also get snarfed up faster. 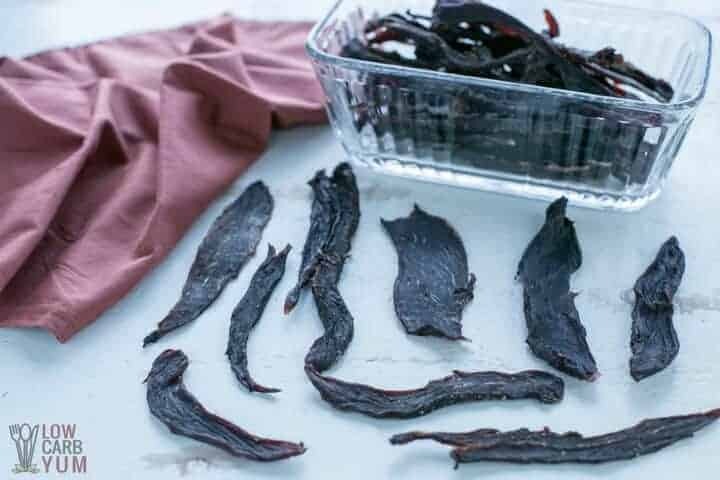 So, you may find you need to make more venison jerky in the oven or dehydrator. 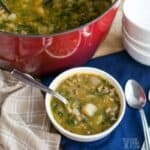 If you don’t have any venison meat, you can use regular beef for the recipe. Or, you can try my beef jerky recipe made with ground beef. 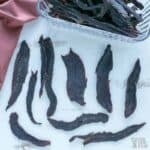 Once you discover how easy it is to make your own jerky, you won’t be tempted to buy the kind in the stores. Plus, there’s no funky added ingredients. To make things even easier, you can ask the butcher to slice the meat in thin strips so you don’t have to. And, they shouldn’t charge more for that. 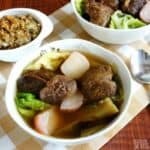 If you have access to other game meat, jerky is always an excellent option for preserving the meat. 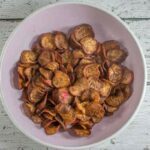 Dried meat is also one of the best keto snacks around! Many commercially prepared meat jerky contain sugar in the marinade. 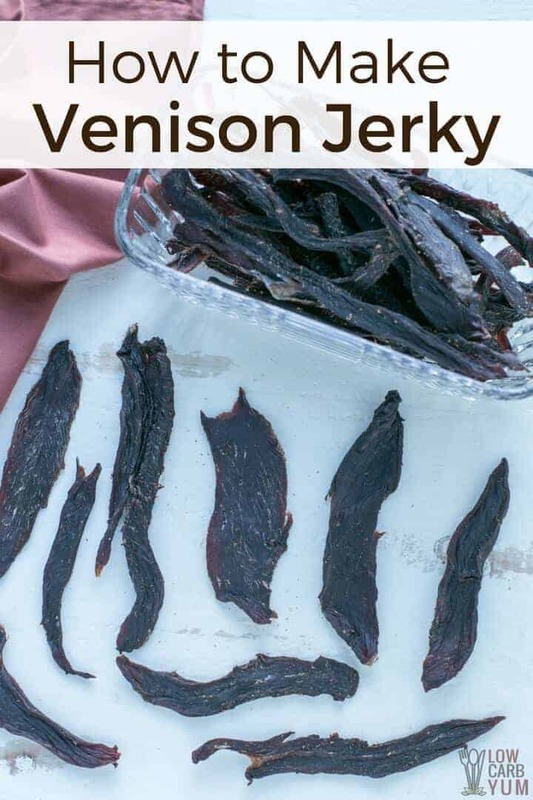 Making your own venison or beef jerky takes a bit of time but it is well worth it. Slice meat into thin pieces (this is easiest to do if meat is still frozen). For a softer jerky, it's best to soak the meat slices in a brine solution for 24 hours to tenderize the meat and remove the blood. 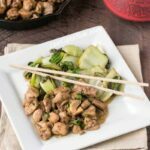 In a large releasable plastic bag, combine soy sauce, Worcestershire sauce, liquid smoke, pepper, garlic powder, onion powder and salt. Place meat in, and close bag. Refrigerate overnight. Knead occasionally, to evenly distribute marinade. Preheat oven or dehydrator anywhere between 145 to 165 degrees F. If using regular oven, place a pan on the bottom of oven to catch drips, or line with aluminum foil. Place meat on racks so that they do not touch each other, and dehydrate for 5 to 7 hours or until meat breaks when trying to bend.